We are a 501(c)(3) Non-Profit Corporation registered in the State of California, and we’ve been changing lives for almost 20 years. We’re a group of blind and sighted professionals dedicated to teaching blind people of all ages to see with sound. This, along with our pioneering high-performance Perception Cane training, gives blind persons the skills to become more self-confident, self-directed and self-reliant, for a life of purpose, achievement, and the dignity of independent Perceptual Freedom. Learn more on our WHO WE ARE page. We teach blind people to break free of traditionally taught sighted dependence and take charge of their right to self-determined freedom of movement, freedom of access, and freedom of achievement and participation as an equal citizen of the world. In our process that we call “Visioneering”, we teach blind persons to produce sonic echoes that we call “FlashSonar” from tongue clicks, hand clapping, finger snapping or using clickers or castanets and combine them with additional sonic feedback from full-length Perception Canes to activate, or “light up” the visual cortex – the part of the brain normally used for processing sight – and train it over time to re-wire and produce SonarVision. 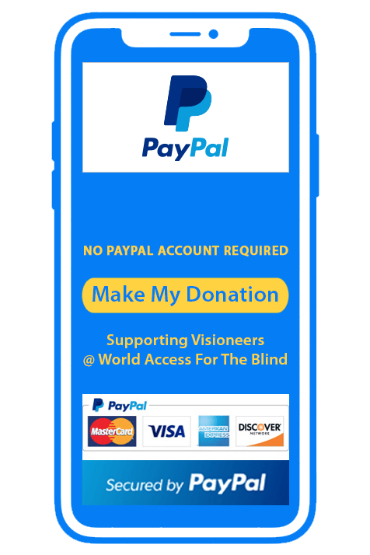 Visioneers is one of the few organizations in the world inspired by blind people, built by blind people, and led by blind people, and we are known throughout the world for our ground-breaking and effective Master’s Degree level work. In the case of Visioneers, when the blind lead the blind, they learn a new way to see. Our approach to blindness is clear, broad, and respectful. It is unparalleled in its focus on self-reliance and possibility. It is based on the latest research in human perception, and rooted in the exemplary experiences and successes of many blind people. Learn more about our services for individuals, groups, blindness professionals, Schools, Enterprise, Media, Research, Tech and more on our Services Directory Page. Only they can tell you what it feels like to learn how to liberate themselves from dependence and isolation. Only they can describe the feeling of experiencing Perceptual Freedom for the very first time. And only their families can describe the sweep of emotions of witnessing their blind child becoming more self-directed, and self-confident as they fearlessly deploy our FlashSonar™ Echolocation to light-up the world around them with flashes of sound that enable them to see in a new way. Read and hear for yourself what our Student Visioneers and their families have to say about their life-changing experiences on our Results & Impact Page. MEET SOME HIGHLY ACCOMPLISHED PEOPLE WHO DON’T NEED FIXING. They don’t need pity. Or lowered expectations. They deserve dignity, opportunities, and respect for their achievements. We expect nothing less for all blind people. When it’s a beautiful day, our students ‘see’ it in a new way. Our scientifically-proven FlashSonar™ echolocation lights-up the brain’s Visual Cortex with audible spatial ‘mapping’ to light-up their world and enable them get the most out of every day. Read their stories, and those of other blind people we admire. We begin by introducing our own Perceptual Navigation Instructors, and other members of our Team who live a ‘NO LIMITS’ day everyday. Learn more on our #BlindNotBroken Page. BE A FLASH OF INSPIRATION AND BECOME ONE OF OUR CHAMPIONS! Even in this day and age, many blind children in the United States and around the world are ‘falling through the cracks’ of society due to a lack of funding or lack of access to educational resources and services, resulting in language and mobility delays and leading to isolation and dependence. The situation is even worse if they have been diagnosed on the Autism spectrum or with other sensory conditions. For over 18 years, World Access For The Blind | Visioneers has specialized in working with these students, their families and school districts. We need to train and hire more instructors in the USA to meet the backed-up demand for our services. Be a flash of inspiration for a blind student by contributing to our FlashSonar™ Tuition Scholarships, so that they can learn to light-up their world and leave the darkness behind. Make an online contribution through our secure payment options. Thank you! Whether as the ‘real-life Bat Man’, or as co-stars with over 27 million views in X Ambassadors’ RENEGADES video, our FlashSonar™ clicks have echoed to over 2 billion global viewers and listeners via top international Radio|Podcasts and TV|Video networks and well as in top international online and offline newspapers and magazines, and across the Internet via the major Social Media apps. In fact, many of our students first learn about our work via programs about us that have aired or been published in the media in their country, bringing us students from Australia, Austria, Belize, Canada, Chile, China, Denmark, Finland, Germany, Iceland, Japan, Kenya, and many more. Sample some by starting out on our Media Directory Page. Our “Visioneering” methodology incorporates our specialized form of human echolocation that we call “FlashSonar”, consisting of flashes of tongue-click echoes reflecting from the surrounding environment like flashes of light, combined with full-length Perception Cane training using longer than traditional blind navigation canes. All this produces combined audible perceptual context that activates the brain’s visual cortex to produce a sort of fuzzy spatial geometry that we call SonarVision – “seeing with sound”. “Echolocation and FlashSonar” is an introduction to the two main perceptual skills involved in the process as a precept for training the brain to rewire itself over time using neuroplasticity to produce SonarVision. Learn more. We’re very proud that our work has been recognized and rewarded by The Zero Project as an Innovative Practice, selected by The Zero Projects selection committee of renowned disability and accessibility experts. The Zero Project was initiated by the Essl Foundation in 2008 and focuses on the rights of persons with disabilities globally. It is a platform where the most innovative and effective solutions to problems that persons with disabilities face, are shared. Its mission is to support the implementation of the United Nations Convention on the Rights of Persons with Disabilities (UN CRPD) and to work for a world without barriers. Learn more about the work of Zero Project and Ashoka , and watch Lead Visioneers and Ashoka Fellow Daniel Kish’s Keynote on our Special Report Page. Daniel and Brian join Aya Nishikawa, Senior Manager Sony Quality & Environmental Dept, Human Centered Design Professional and Takamoto Tsuda, Design Manager, Sony Creative Center, UI/UX designer, at the SONY WOW Studio at SXSW 2019 in Austin, Texas to talk about inclusiveness in product design, as exemplified by SONY’s CAVE without a light. All is explained in the video below. Daniel and Brian wish to thank Aya Nishikawa and Takamoto Tsuda along with their SONY Team for a great inclusive experience at SXSW2019 in Austin, and for their hospitality and friendship. We look forward to following up on the ideas discussed and commend SONY for making more products, experiences and services accessible and inclusive for everyone. Our collaborative research projects have validated our techniques of combining FlashSonar click echoes with additional sonic feedback from Perceptual Cane work to activate the Visual Cortex, the sight processing center in the brain. With repeated practice, the audible prompts train the brain to rewire to produce what we call SonarVision. We’ve consolidated the media coverage of the related scientific papers, including those co-authored by Daniel Kish, with a new video on our Science of SonarVision page. Gordon N. Dutton, MD, FRCOpthal, FRCS is Emeritus Professor of Visual Science at Glasgow Caledonian University in Scotland. Professor Dutton is also an Advisor and Contributor to CVI Scotland, a website devoted to helping people understand cerebral visual impairments, working towards mastery of this complex spectrum of conditions. Over the almost 20 years that Daniel has been teaching blind people to see in a new way, media coverage of this work invariably throws a bit of sensationalism into the headlines by referring to him as “The Real-life Bat Man”. More recently in the wake of the “Daredevil” movie, some people think he should be called “The Real-life Daredevil”. We’ve examined the debate in a video on our Science of SonarVision page, from both a factual and tongue-in-cheek perspective. And Daniel weighs-in with a short essay on the matter. Daniel Kish’s ability to see with sound has been taught to other blind children, teens and adults for almost 20 years to the point where more than just life-changing skills and philosophies are being passed to subsequent generations of blind children. Inspiration has also been “paid forward” by the achievements of our students. Student Visioneer Humoody has been a living embodiment of our “NO LIMITS” philosophy. Learn about his achievements and “Paying It Forward” on his page in our Results and Impact Section. One of the earliest inspirations for Founder and Lead Visioneer Daniel Kish was hearing the story of Jack and the Beanstalk as a child. It sparked a curiosity about climbing trees that is still a passion today, and one that he has paid forward to many of his blind student Visioneers over almost two decades of SonarVision instruction. Click on Scott Gustafson’s illustration of Jack and The Beanstalk to take you to a video excerpt on Humoody’s page from Daniel’s Keynote address at Aspire 2018 where he explains the inspiration. Preben Mathieu-Bjerke and the rest of the Team at Visioneers Norway are busy planning SonarVision Workshops for 2019. Preben is the father of three year-old Student Visioneer Luca, and you’ll soon see a page about Luca in our Results & Impact section showing the beneficial results of early childhood Visioneering. If you or someone you know in Norway have interest in being a part of the 2019 SonarVision workshops, please respond to the poll on Visioneers Norway’s Facebook Page. The “click” we call FlashSonar™, a refined form of echolocation that uses tongue clicks to send out sharp flashes of sound which reflect off near and distant shapes and surfaces, echoing acoustic imagery to the brain, like bats, dolphins and some toothed whales. The “stick” we call the Perception Cane which is lighter, longer and more conductive than the white canes traditionally used for blind navigation, making them more effective and easier to use. Our collaborative projects with research centers in the U.S. and around the world have led to the discovery that the echoes from FlashSonar clicks reflect off surrounding objects, sending auditory signals that activate, and are processed by, the brain’s Visual Cortex. This part of the brain, normally used for sight, produces something of a real-time spatial map that we call “SonarVision”. Repeated deployment trains the brain over time to re-wire to “see” with sound. We’ve integrated all this with data from early childhood cane studies and human biomechanics into the “Visioneering” of our model for movement and navigation, achieving greater impact for more blind people as we teach them younger, faster, better, and at lower cost than traditional methods. Our unique and innovative Visioneering approach quickly enables our blind students to achieve unprecedented freedom from the generational indignities of imposed dependence and isolation. For over 18 years, Daniel Kish and our Team have taught our unique Perceptual Navigation to over 15,000 blind persons, their families, instructors and community members. Now, we’ve re-engineered an expanded suite of High-Performance Visioneering Services. Book Daniel Kish or our other Visioneers for Individual, Group or Community instruction, or as Speakers to make your next Corporate, Tech, Educational, or Service Conference Activational! Freedom of movement and personal choice (self-determination) are usually regarded as basic human rights, but these personal liberties are often denied persons who are blind and/or face other ability challenges because of non-existent or outdated services. Visioneers’ (WAFTB’s) methodology is uniquely led by qualified, skilled blind people allied with a cross-disciplinary network of scientists, psychologists, neurologists, educators and therapists. In a world that is often not user-friendly for blind people, we appreciate champions like you who stand among the pillars that support our efforts to help blind persons claim their freedom of access to achieve and contribute as equal citizens in our communities. Your generous support is an investment in a sound vision for change, building stronger communities and achieving human potential. Join us! Please Donate and/or Volunteer via info@Visioneers.org. Book one of our VISIONEERS for a keynote speech or a VISIONEERING Workshop and watch as they go Activational to recalibrate everyone’s perceptions of the capabilities of blind people and how we teach them a new way to see with sound by seeing and thinking about the world around them in a new way. When it’s a beautiful day, our students see it in a new way using SONARVISION! Watch our Speakers videos and learn how we teach sighted people to see through the dark unknown of challenges at home, school or work and join the ranks of TED, Proctor & Gamble, PayPal, PopTech, and other Fortune 500s that have booked and acclaimed our Activational Speakers. Our Visioneering concept reﬂects emerging ﬁndings that blindness isn’t about not seeing; it’s about NEW ways of seeing. The development, field-testing, refinement and documentation of our approach is uniquely led by our qualified and skilled blind Visioneers. The majority of our Instructional Visioneers have Master’s Degrees in Special Education and other studies. They are allied with a cross-disciplinary network of scientists, psychologists, neurologists, educators and therapists. Learn more about our in-house expertise in Developmental Psychology and dealing with blind children on the Autism Spectrum, and why we advocate for early education on our Personal Visioneering page. Visioneering individual or group courses for blind and sighted education and blindness professionals in Continuing Education, enriching professional development, and activational leadership to help upgrade and advance the Orientation and Mobility (O&M) field. We are the only organization in the world offering a Certification Course in FlashSonar™ echolocation and full-length Perception Cane Instructional training. Our Visioneering workshop format has been developed over 20 years of experience conducting perception and achievement trainings and workshops throughout the world and to a wide range of attendees. Learn more about our Activational Certification Course on our Professional Visioneering page. And we can bring it to a classroom, an auditorium, or via a long-distance Skype video call or Conference. How cool would it be to learn to “see” in the dark just like bats, dolphins and some toothed whales? And yes, even movie action-heroes like Daredevil. We can fashion Activational Workshops to enhance students’ understanding of the Science of FlashSonar, the Biology of how it works in humans and animals as well as the History and Social Studies aspects of how sighted people have treated blind people over the years, and the Geography aspects of what we’ve learned in the 40+ countries where we’ve provided services. Learn more and make a booking enquiry on our Educational Visioneering page. Does your Team often hit a blind spot, lose their way and their motivation, especially if they run into a dead end? Are you missing out on customer groups that have different needs and abilities? We can Visioneer Activational Solutions via Keynote Speeches, Team-building, Leadership exercises and Sensory workshops. We’ve re-engineered and re-calibrated our Business Model and Marketing Identity, and we can help you to do the same for your operation by teaching your employees to hear, see and problem-solve in a new way. Learn more on our Enterprise Visioneering page. Just as important as teaching blind people to take better care of their health is teaching the Health & Wellness sectors how to better provide access, support and treatment for the wellbeing of persons with vision-loss and /or other conditions. Many blind persons can relate their own stories of being left out of Phys-Ed, or Boy Scouts or Girl Scouts, or any other activities that provided the benefit of exercise, because of things like antiquated Risk Assessment guidelines, or instructors or leaders with a lack of vision or knowledge when it came to creative recreational inclusion. Learn more about the Sensory and Recreational Workshops we can provide on our Health|Wellness Visioneering page. There are fascinating updated results from the study that Lead Visioneer Daniel Kish has been co-authoring with Dr. Lore Thaler and others via Durham University in Great Britain. They may not be that surprising to Daniel and the students we’ve taught. Daniel and some of our Instructor Visioneers have been working with Dr. Thaler on echolocation studies for a number of years, including her originating work as part of the team under the guidance of Distinguished Professor Melvyn A. Goodale at Western University in Canada. We’ve also consulted for tech giants like Apple, Microsoft, PayPal, NEC and more, as well as start-up entrepreneurs on assistive technology. Learn more about our work in these areas and how we might be able to help you or your company. Unfortunately, we live in a world that is often not user-friendly for blind people and other persons living with one or more disabilities. The current political climate has also made bullies bolder, budgets bleaker, and even Medicare/Medicaid won’t provide white canes for blind persons. That’s why we need good and decent champions like you who are willing to volunteer to raise awareness in your community of our work and the funds needed to support it. We need to train and hire more blind and sighted instructors to meet the overwhelming demand for our services and to enable more blind people to gain the skills to achieve freedom of access and movement to become participating and contributing equal members of society. All donations made in the United States are tax-deductible. THANK YOU FOR YOUR THOUGHTFUL SUPPORT! Our passports bear testament to the growing demand at home and abroad for our services. That’s why we need your financial support to be able to train and hire more instructors, creating jobs in the United States to meet that demand. Here’s a sample of our Visioneers at work across the USA and in other countries where we’ve provided services over the last year. Our Perceptual Navigation Instructors and Coaches are living embodiments of our pioneering and innovative teaching systems because they were once our students, and have grown with us. Their own life experiences with blindness provide powerful insights and inspiration for all our students. In our case, “when the blind lead the blind” they shatter the marginalizing Old-World dogma as they break through to new heights of self-directed achievement and freedom. Echolocation and FlashSonar provides research, case examples, instructional approaches, and practice exercises that can, combined with long Perception Cane use, can lead to mastery of SonarVision. This guidebook, written by Daniel Kish and Jo Hook, provides instructional strategies for teaching persons who are blind and visually impaired who are working independently. Although Echolocation and FlashSonar works well as an instructional manual for O&M specialists, it can also be used by adults who are blind and visually impaired and who are not working with rehabilitation professionals. You can preview the book’s introduction at this link, and order it online at this link. We hope you will enjoy this book, and find it helpful. Neither the authors nor Visioneers / World Access for the Blind receive any royalties from the sale of this book. If you find this book helpful, please consider helping us reach more blind students in more places with your tax deductible donation to World Access for the Blind on our Make A Donation page. Whether as the ‘real-life Bat Man’, or as co-stars with over 27 million views in X Ambassadors’ RENEGADES video, our FlashSonar™ clicks have echoed to over 2 billion global viewers via top international TV & Radio networks and well as in top international newspapers and magazines, and across the Internet via the major Social Media apps.